They have jobs as housekeepers for some friends who own a motel. Four or five days a week, they drive into town (Older Daughter now has her driver's license! She passed her driver's test with flying colors! ), work, and then come home. Both are pleased to be earning money and are intelligently divvying their income between savings and spending. Older Daughter is the primary housekeeper, and when there are too many rooms for her to handle on her own, she "hires" Younger Daughter to assist. Younger Daughter also works as a groundskeeper for some neighbors when they're away traveling. On the days they use the car, we charge Older Daughter $4 for gas (about how much it costs for each round trip into town). We are also requiring her to pay $50/month for her car insurance, which is tacked onto ours (insurance costs are low in Idaho). Such is Real Life. Nonetheless the girls are earning money, and are having a lot of fun deciding what to do with it. Older Daughter is saving up for a car. Younger Daughter is socking away a lot of her earnings, also with the notion of a car in the distant future. We opened up checking accounts for both kids so they can start learning the intricacies of handling their income -- the mechanics of deposits, withdrawals, debit card use, online banking, balancing a checkbook, etc. With the (cough) "power" of a debit card to make online purchases, both kids spent a bit of money at first, primarily ordering books they've wanted. They're learning to set aside a certain amount of "play" money and not go beyond that amount without considering whether the purchase is really worth it. I found it interesting that after a couple of fun days in town when the girls went to the grocery store and bought their lunches, they quickly realized how easy it is to fritter away their paycheck on unnecessary and temporary pleasures (such as deli food). Now every morning they diligently pack a lunch to bring with them. I'm proud that our girls are developing a reputation for being hard workers. I'm also pleased that they're discovering, through their own efforts, the basics of Real Life economics. Last Monday Younger Daughter did something momentous: she got her ears pierced. We required both our girls to wait until they were sixteen before deciding on this. Older Daughter was actually a couple of weeks short of sixteen when she got her ears pierced, but that was because their grandparents were up visiting and wanted to see the procedure. Younger Daughter vacillated a bit about whether to get her ears pierced or not, but as her 16th birthday came and went, she decided firmly in favor. So off we went to Claire's, a bling store. We had a fairly long wait because there were a surprising number of people ahead of us, getting their ears pierced. Two or three younger children (in the seven or eight-year-old range), a couple of young women, and one older man with a graying pony tail (well why not?). I noticed this stuffed teddy bear underneath the "hot seat" for younger kids to clutch during the procedure. One of the littlest girls having her ears pierced declined the bear. "I'm not about to get shown up by a kid," muttered Younger Daughter, getting a bit nervous as the wait lengthened. Younger Daughter chose her posts: a set of pearls. Finally it was her turn. She listened as the young woman doing the piercing explained the procedure. ...and then the piercer made little dots to show where the piercing would happen. ...then the other. I was impressed by the level of cleanliness the piercer maintained -- gloves, sterile posts, sterile piercing gun. (Better than when I got my ears pierced back in 1983!). Younger Daughter said the procedure hurt a LOT less than she thought it would -- and was very pleased with the results. The young woman showed Younger Daughter how to clean her ears, how to twirl and move the earrings, etc. The results are classy and lovely. Another step toward young womanhood! Here's my WND column for this weekend entitled We the People are NOT the Enemy!! A couple of weeks ago, I was in the barn pitching hay when one of the hens darted forward at something. Whatever it was must have disappeared since she stared intently for a moment or two, then walked away. A few minutes later another hen darted forward... and this time she snatched up what looked like a mole. She proceeded to bash the poor little thing against the ground, then pecked at it viciously. In moments it was quite dead... and then she ate it. Chickens are far more carnivorous than we give them credit for. We all know they eat grubs and worms and other things they find. But a small mammal? That one surprised me. 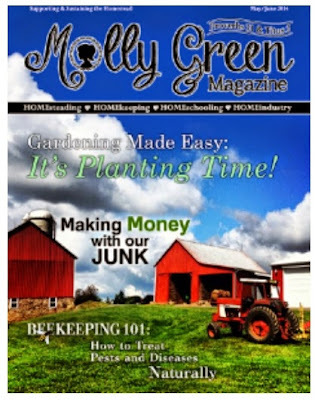 If you have a heart for HOMEsteading, HOMEkeeping, HOMEschooling, and HOMEindustry, then Molly Green Magazine is looking for you! Come join our team of magazine, blogging, and social media writers, and share your love of all things HOME with thousands of like-minded readers. We are seeking writers to join our writing team at Molly Green Magazine. 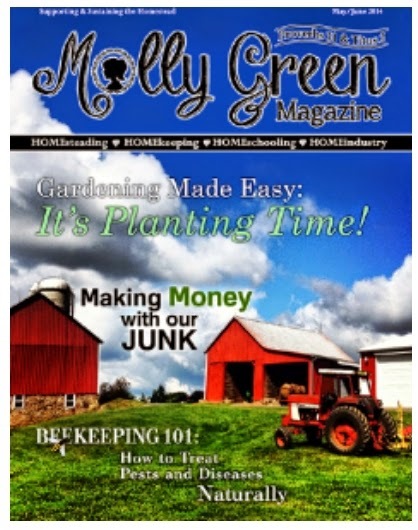 Molly Green is all about HOME life: Homekeeping, Homestead life, Preparedness, Homeschooling, Home Industry and so on. We are busy re-launching our website, and e-newsletter –- gearing up to get everything in gear for a July launch –- as the latest issue of the magazine comes out. Right now we are building a team of writers to make Molly Green the premiere publication in its niche. Not only has the design of the magazine changed, but so has our entire vision. For the remainder of the year we will be branching out even more, including a newly-designed website that features member sites for selling homemade products (featuring our members), and also social media avenues for members to talk and connect with each other. 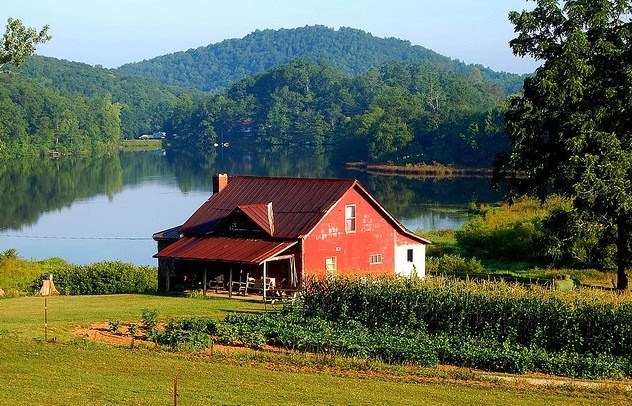 If you are interested in this endeavor, please send us an email, sharing about you, your homestead, your interests, and how you can contribute to our new adventure. We look forward to discussing this role with you. I spoke with Lisa yesterday and will become a regular contributor. I hope some others might join them as well! About a week ago, I looked at Polly's backside and decided she was so broad in the beam that giving birth was imminent. So to her annoyance, we tucked her into the corral, which has access to the barn for shelter. She wasn't overly pleased by this, but whenever possible we prefer calves to be born close to home (rather than down in the woods or somewhere in the pasture), since we usually have to either dehorn or castrate a young calf within a few days of birth. Plus it safeguards the baby against predators. We tucked Petunia, Polly's yearling calf, in the corral with her for company. The animals settled in. Polly complained a lot when we scooted the rest of herd out of the woods and down to the pasture. Wait for me! I wanna go too! I noted the amniotic sac but didn't see the tiny hooves poking out inside the sac, so I thought I had more time than I did. I went into the house for ten minutes -- ten minutes tops! -- and when I came back out, this is what I saw. Delighted as I was with such a quick and uneventful birth, I soon noticed something was wrong. Polly was ignoring the calf. She wasn't licking it at all, not even a bit. Licking is important for newborns for three reasons: it cleans them, it stimulates their circulation, and it familiarizes the mother with the calf's unique scent. But Polly was having none of it. This surprised me, since she did such a wonderful job with Petunia, her first calf. She wasn't acting hostile, just... indifferent. This concerned me enough that I dug some first-day colostrum out of the freezer (from last year when Matilda was unable to nurse Amy) and defrosted it, just in case I needed to bottle feed. Meanwhile, I saw a tiny scrotum. A bull calf. ...which lasted about ten seconds before he crashed. Concerned that he wasn't getting cleaned off, I got some rags and wiped him down a bit. Meanwhile Polly ate breakfast with an apparent complete lack of interest that she had a new baby. Despite Polly's continuing indifference, he persisted. Calves take a little while to get the hang of things, and this tiny boy spent a lot of time gumming Polly in various places. He even tried Petunia, who would have none of it. So he tried mama again. Polly still acted aloof, but thankfully not hostile. I think I got a clue as to why Polly was behaving as she was. She hadn't yet passed the placenta, and she was in acute discomfort as a result, with cramps and contractions. She her arched back? That's a contraction. Last year, our cow Victoria did the same thing when she birthed Rosy: acted skittish and restless until she delivered the placenta. Then she settled right down. We went to church, and by the time we got back the little fellow was dry and looking seriously adorable. Polly had passed the afterbirth and was much more relaxed and attentive. And my goodness the calf had turned into a vigorous nurser! Making up for lost time! Then, when his little belly was full of warm colostrum, he drowsed in the sun. So all is peaceful in the barnyard once again. We named the calf Chuck. As in roast.